"Beauty is truth, truth beauty,—that is all Ye know on earth, and all ye need to know." 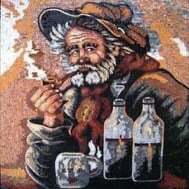 PROs: Handmade mosaic art composed of high-end marble tiles that is guaranteed to elevate your space. Mosaicist: Mo AR. CONs: You may be tempted to write an ode to this Grecian urn mosaic art.